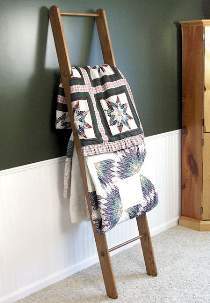 Our Library Ladder Quilt Rack lets you display several quilts at one time. This 6 foot ladder features oak dowels with embossed oak ornaments to cover the attachment screws. Order ten embossed ornaments, and five dowels below. or see special offer.